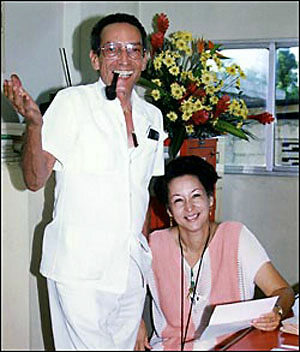 Jean Dominique and Michèle Montas celebrating the anniversary of the station in the Radio Haiti newsroom, 1990. From the Radio Haiti Records. The Human Rights Archive at Duke University’s Rubenstein Library and the estate of broadcaster Jean Dominique have announced a partnership to preserve the broadcast archives of the journalist’s iconic Radio Haiti station. From the 1960s to 2002, Radio Haiti was that country’s first independent radio station, promoting democratic freedoms, speaking out against human rights abuses, and celebrating Haitian life and culture. The station’s archive includes approximately 2,500 audio recordings of programs, as well as 28 boxes of paper records. Recordings include daily coverage of events, cultural programs, interviews on public affairs, political analysis, and roundtable discussions on different aspects of Haiti’s recent history. The Radio Haiti archives were donated to the Rubenstein Library by Michèle Montas, station co-anchor and widow of Jean Dominique. 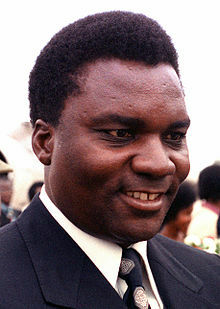 Dominique had an unquenchable passion for Haiti and its people, and his quest for truth and justice may have led to his assassination in 2000. On April 3, Montas will be at Duke to discuss the history of Radio Haiti and its archive. 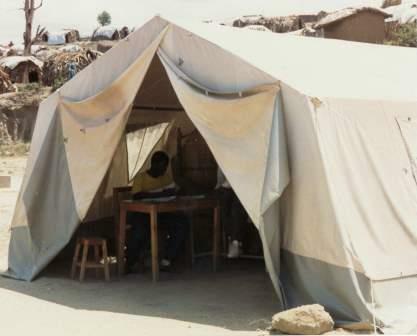 Archivists from the Rubenstein Library will also share some of the challenges of preserving such a large audio collection and discuss the importance this archive has for the broader Haitian community and the human rights movement. Those interested in learning more about preserving Radio Haiti can visit Duke Library’s Youtube channel. The event is free and open to the public and will be held at 12 p.m. in the Forum for Scholars and Publics, Old Chemistry Building Room 011, on Duke’s West Campus. Lunch will be provided. The Radio Haiti archives join other recent acquisitions by the Rubenstein Library documenting the history of Haiti, including the records of the National Coalition for Haitian Rights, the Mark Danner Papers, and a scribal copy of the Haitian Declaration of Independence dating from 1804. The Radio Haiti archives will open for research after conservation review and archival processing are complete. For more information, contact Patrick Stawski, Human Rights Archivist. We’re celebrating the beginning of a new fiscal year with a week’s worth of new acquisitions from the first half of 2012. Two newly acquired selections will be featured in a post every day this week. All of these amazing resources will be available for today’s scholars, and for future generations of researchers in the Rubenstein Library! Phantom des Menschenhirns, by Ludwig Fick: Published in 1885, this ephemeral pamphlet includes two diagrams of the brain. One diagram features moveable flaps, making this item a nice addition to the History of Medicine Collections‘ anatomical flap books, highlighted in last year’s Animated Anatomies exhibit. 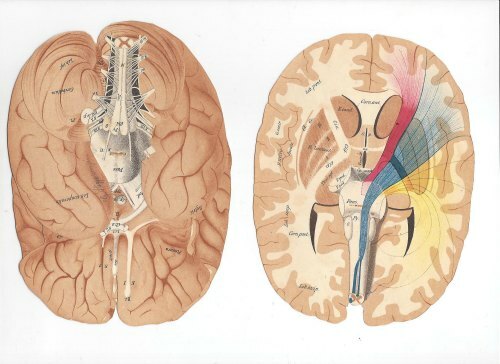 Diagram of the brain, from Ludwig Fick, Phantom des Menschenhirns (1885). Joy Golden Papers: Joy Golden was a well-known advertising copywriter who started her own creative company, Joy Radio, in the 1980s that specialized in humorous radio advertising. She did a series of commercials for Laughing Cow Cheese that became particularly well known. She also was active in the Friars Club, including holding the position of Governor. Her papers include files related to her work in advertising from the 1960s forward, and audiotapes of many of the radio advertisements created by her company. Her papers add to the Hartman Center for Sales, Advertising, and Marketing History‘s rich collections on women and advertising and the development of radio advertising. Doris Duke at Shangri-La, ca. 1960-65. From the Doris Duke Charitable Foundation Historical Archives. New York’s Museum of Arts and Design is preparing an exhibition entitled “Doris Duke’s Shangri La: Architecture, Landscape, and Islamic Art,” according to GalleristNY. 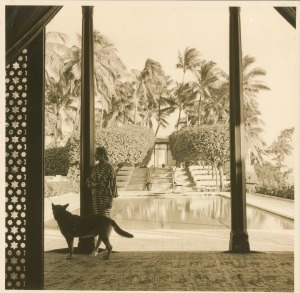 The story features a beautiful photo from the Doris Duke Papers on the Shangri La Residence here in the Rubenstein. The exhibition is scheduled to open on September 7, 2012. Two stories in the Durham Herald-Sun document the Rubenstein Library’s May 15 event to celebrate the publication of Reynolds Price’s final memoir, Midstream, and the fiftieth anniversary of the publication of his first book, A Long and Happy Life. The Raleigh News and Observer reported on Durham County Library’s Comics Fest. Rubenstein Assistant Curator Will Hansen spoke about the Library’s comic book collections on a panel entitled “Comics Go to College” with colleagues from Duke and UNC. The May/June issue of Duke Magazine features a piece on advertising pioneer David Ogilvy, whose career is documented in the Kenneth Roman Papers; an article about Princess Irene’s 1967 visit to Duke by University Archivist Valerie Gillispie; and a column on the American Family Robinson radio serial, rare acetate discs of which are preserved in the Randy Riddle Collection of Race Records and Radio Programs. Look for more exciting news about the Rubenstein Library in the coming months!